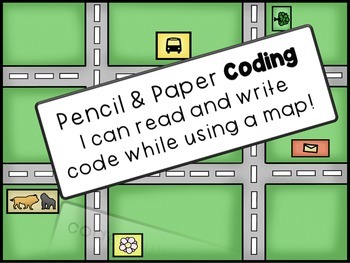 These 3 activities focus on writing code using paper and pencil. Coding is a great critical thinking activity because the students have to position themselves on the map and move by holding their place in their mind. These activities can be extended to procedural writing activities. Write code and then explain your steps. "First, I left the zoo and turned East. Then, I went straight through 2 intersections..." etc. I also have a BUNDLE that include this resource and the two listed above. 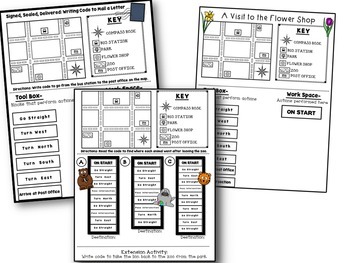 Paper & Pencil Coding Bundle- 3 Products in One! Help "Duncan Dot" recycle items and create a lined bar graph by sorting the recycling into different categories! Then, answer comprehension questions using the data. Also, help the local Tree Nursery deliver trees to business by coding while using a map.